Valentine's Day Special - 20% discount - Call the Gold Sales Division for details (530) 287-3540. Inhouse quantities limited. A sample of the high-grade ore recently mined. Total weight of these three rocks is 30 lbs. approx. gold content 148 ounces. Oops! Derailed at the dump pocket. See Publications for complete photo essay. 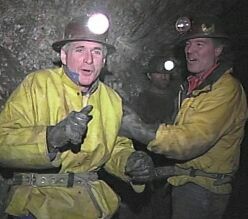 Comedian Jack Gallagher Goes "Off Limits" with Michael Miller in the Sixteen to One Mine. The episode airs Wednesday, October 17th, at 7:00 pm on KVIE Channel 6 in Sacramento. The Corporate Office in Alleghany. Apples are just about ready for homemade pie. Especially made for the Miners at The 16 to 1 Mine and now 20% off through September 15th - Visit Gold Sales on our site for more information. This is the sign indicating "you made it!" to our office and didn't get lost in the booming Town of Alleghany (pop. 75). Main adit to the Sixteen to One Mine. © 2019 Original Sixteen to One Mine, Inc.